How do marine fish and invertebrates use or make sound when feeding? 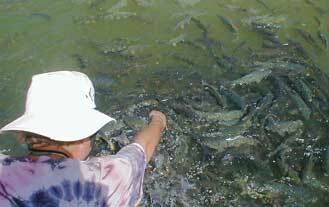 The most common sounds associated with feeding fish are simply a result of chewing and ingesting food items. The diets of many fishes include the skeletons of crustaceans and other fishes, and the calcium carbonate skeleton of corals. Crunching sounds are produced when the fishes’ teeth chew on these hard objects. Even fishes that eat seaweeds, algae and seagrasses may produce sounds in this way. Sounds produced while feeding may be detected by other fishes and used as cues to indicate feeding opportunities. These sounds can be quite obvious even to people. 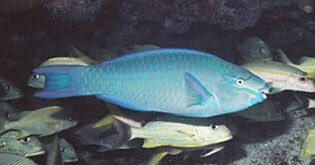 For instance, the queen parrotfish biting chunks of coral reefs are often heard by divers. The Queen parrotfish makes a “crunch” sound while feeding on coral. Photo courtesy of Alfredo Cavalho Filho, alfie@telnet.com.br. Hydrodynamic sounds produced by fishes may also provide information on feeding opportunities. For example, large schools of fish such as jacks (family Carangidae) or ladyfish often begin voracious feeding frenzies when they locate areas abundant in prey items. During these feeding frenzies, rapid changes in swimming velocity produce low frequency hydrodynamic sounds that may attract other fish to the area, including predators such as sharks. Scientists believe that sharks are attracted to naturally occurring, rapidly pulsed, low frequency sounds. Sources of these pulsed sounds include quickly swimming, schooling fish (like that of a feeding frenzy), schooling fish being attacked at the surface (and leaping out of the water), other sharks that are actively feeding, as well as wounded or struggling fish. These attractive signals are thought to indicate to sharks the presence of available prey. Sounds that may be used to deter other predators and competitors have also been observed during feeding frenzies. It has been hypothesized that low frequency hydrodynamic sounds produced by a wounded or struggling fish attract sharks. A fisherman using a live fish as bait is trying to take advantage of this possibility. Photo courtesy of Christie and Wiley Long, www.longstrangetrip.com. In some cases sounds may be intentionally produced during competition over resources such as food. Researches have described in detail the sounds made by streaked gurnards while competing for food. Aggressive chasing behavior accompanied by low growling sounds were emitted by these fish when competing for prey items. Similar growling sounds are also produced by rockfish species (Family Scorpaenidae) during competitive interactions. Little is known about how marine invertebrates use sound to feed. Invertebrates usually scavenge for their food using chemical cues produced during the decomposition of organic matter. However, many marine invertebrates have specialized mechanoreceptors know as chordotonal organs, that enable them to detect vibrations associated with sound. There are circumstances where these organs may alert invertebrates to potential food sources. 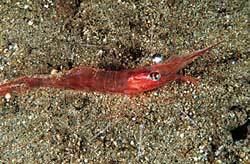 For example, the northern shrimp may be able to detect food falling to the seafloor with its chordotonal organs. The impact of a sinking carcass coming in contact with the seafloor may create vibrations that could clue the shrimp to the possibility of a newly available food source. Once alerted to this possibility, the shrimp may then be able to use chemical cues to locate the food. The Northern shrimp, Pandalus borealis, may use hydroacoustic signals to detect falling food. Photo courtesy of Erling Svensen. Similar to sounds produced by feeding fishes, marine invertebrates produce stridulatory sounds while feeding. These sounds are made by the movement of appendages or mouth parts used while feeding. Sounds produced while feeding may be detected by other marine organisms alerting them to the possibility of a near by food source. Schrope, M. 2002, Deep-Sea Creatures Hear Food Coming. Discovery News. January 28, 2002. Myrberg, A. A., Jr., Ha, S. J., Walewski, S., & Banbury, J. C. (1972). Effectiveness of acoustic signals in attracting epipelagic shark to an underwater sound source. Bulletin of Marine Science, 22(4), 926–949. Myrberg, A. A., Jr. (2001). The Acoustical Biology of Elasmobranchs. Environmental Biology of Fishes, 60(1–3), 31–46. Banner, A. (1972). Use of Sound in Predation by Young Lemon Sharks, Negaprion Brevirostris (Poey). Bulletin of Marine Science, 22(2), 251–283. Myrberg, A. A., Jr., Gordon, C. R., & Klimley, A. P. (1976). Attraction of free ranging sharks by low frequency sound, with comments on its biological significance. In A. Schuijf & A. D. Hawkins (Eds. ), Sound Reception in Fishes (pp. 205–228). New York, NY: Elsevier Scientific Publishing Company. Tavolga, W. N. (Ed.). (1977). Sound production in fishes. Stroudsburg, Pa.: Dowden, Hutchinson & Ross.